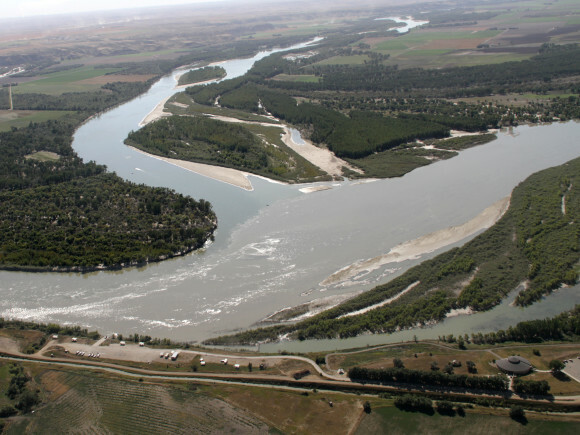 The confluence of the Missouri River with the Yellowstone River – a very important area for Pallid Sturgeon recovery efforts. Gathering at the confluence for a day of spring broodstock collection. 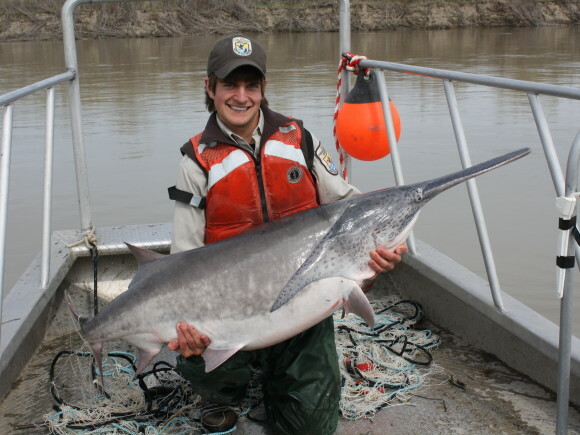 Adult paddlefish are often caught during broodstock and are returned to the water immediately. 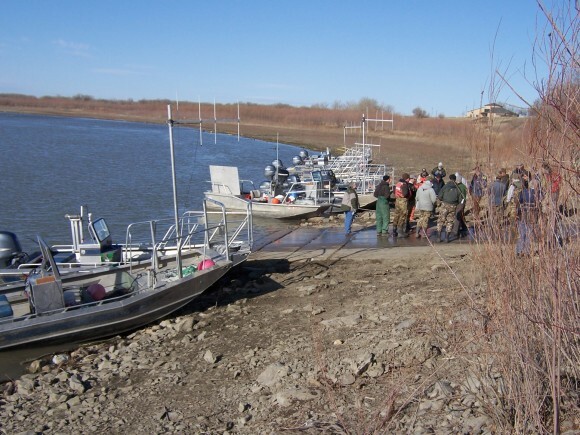 Tracking and recapturing a telemetry equipped pallid near the confluence of the Missouri and the Yellowstone. Implanting a Pallid with a telemetry transmitter. 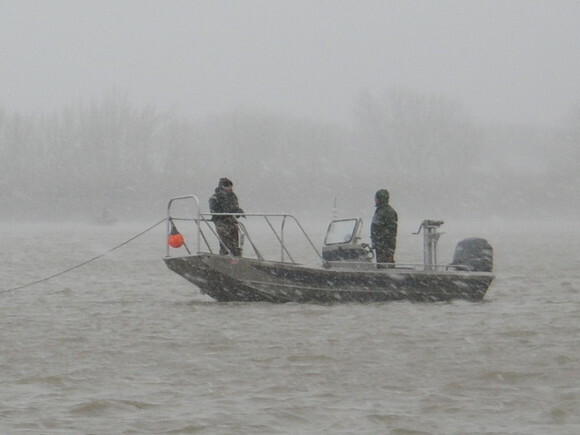 Tracking telemetry implanted Pallids on the Missouri near Williston, North Dakota. 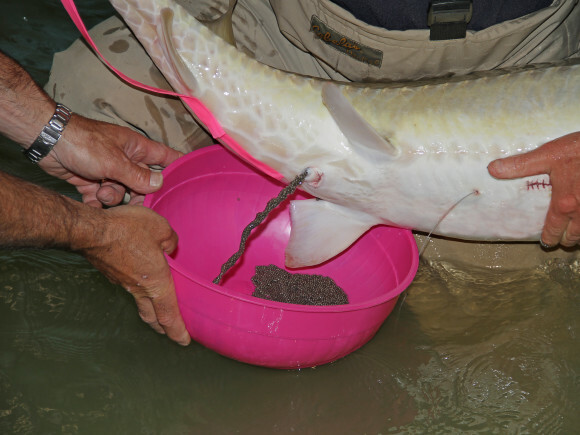 An adult pallid sturgeon awaiting release back into the river. Expressing eggs during a spawning and fertilizing event at the Miles City, Montana State Fish Hatchery. 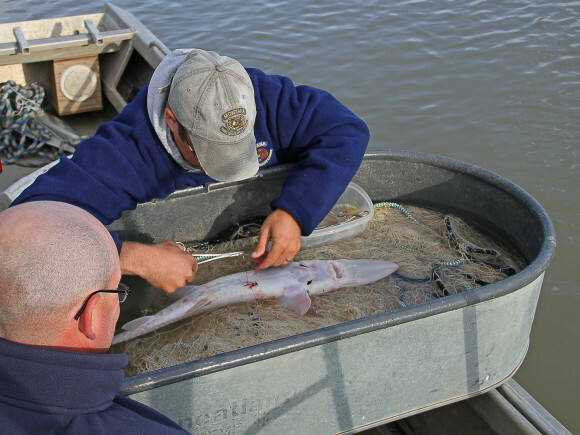 Since 1998 almost 400,000 hatchery reared juvenile Pallid Sturgeon have been released in waters of the Missouri River Upper Basin. 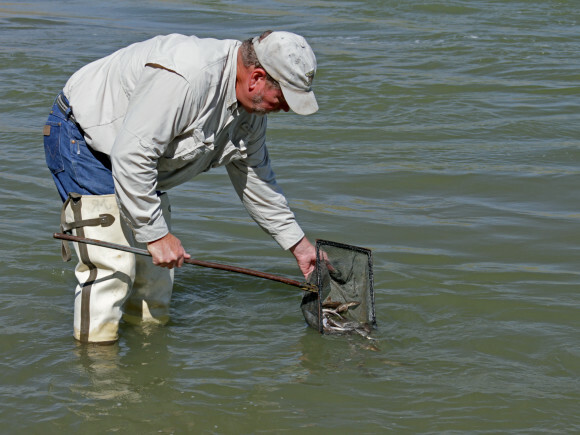 Releasing juvenile Pallids in to the Yellowstone River. 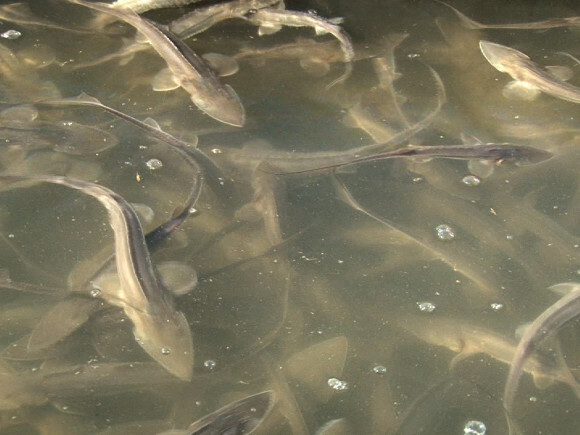 After a long history of ancestral survival through environmental disruptions, mass extinctions and multiple glaciations of North America, this unique fish, the Pallid Sturgeon, is in murky water both literally and figuratively. By the 1980s few young individuals had been observed in the preceding decade and sightings of older fish were rare. In May of 1988 Mr. Peter Carrels on behalf of the Dacotah Chapter of the Sierra Club petitioned the U.S. 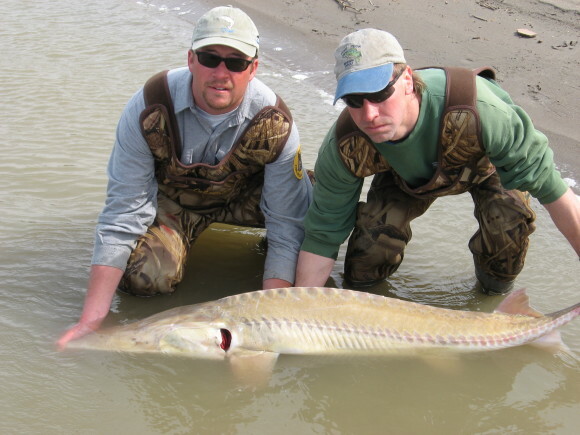 Fish and Wildlife Service (Service) to list the pallid sturgeon as Endangered under the Endangered Species Act (ESA). Mr. Carrels’ letter and the petition can be found under the Endangered Species Act tab under the heading When and Why. 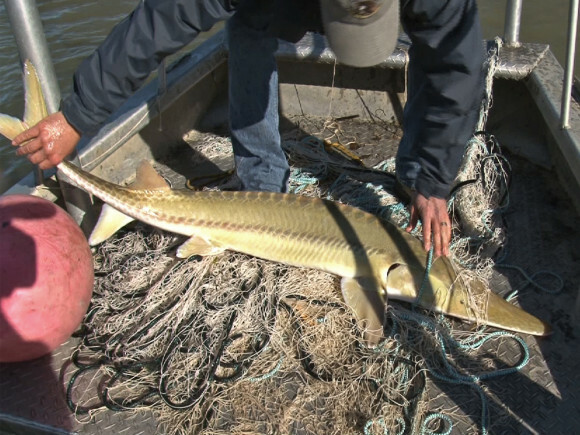 In response to the petition the Service conducted a review of the status and threats to pallid sturgeon. 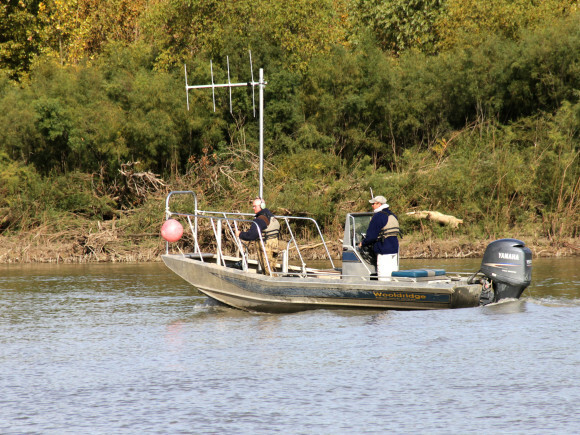 The following known and potential threats that affect the habitat or range of pallid sturgeon were identified: 1) large river habitat alterations, including river channelization, impoundment, and altered flow regimes; 2) water quality; 3) entrainment; and 4) climate change. 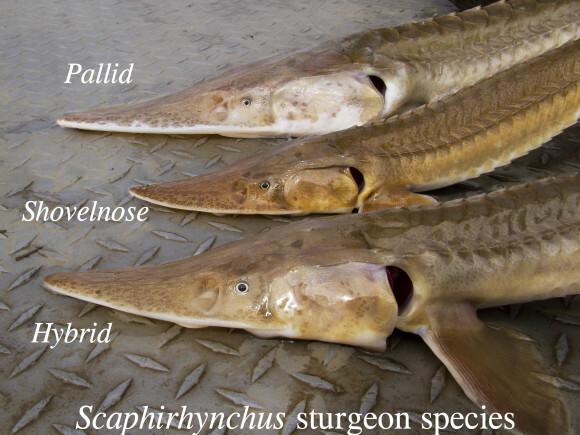 On September 6, 1990, the Service placed the pallid sturgeon on the endangered species list. 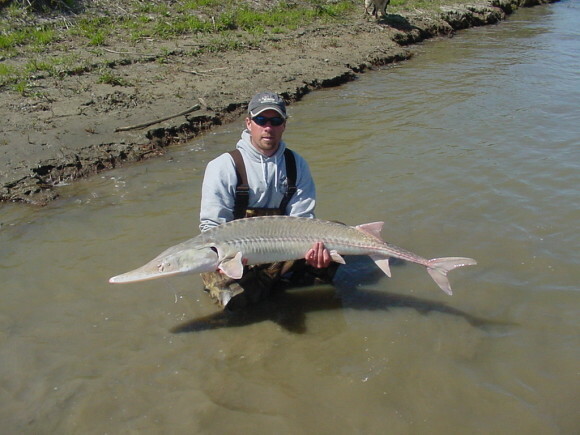 In 1993 the Service published the Pallid Sturgeon Recovery Plan. A partnership between Federal, State and local organizations formed to implement the plan.